With the same photogenic charm of Old Havana, this fist-shaped promontory is literally crumbling. For millennia, successive batterings from sea and invaders — Sir Francis Drake and Napoleon among them — have worn down the ancient trading port and plundered its riches. Fortunately, tourists have not invaded en masse and the snaking white-washed lanes and La Caleta beach remain uncluttered. Art must-sees include the Goya frescoes in the Oratorio de la Santa Cueva and the 21 paintings by Zurbarán at the excellent Museo de Cádiz. 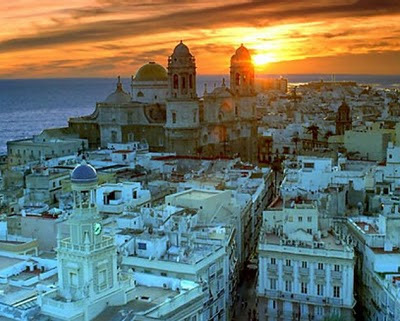 After sunset — best seen from the Parque del Genovés looking across the Bay of Cádiz towards El Puerto de Santa María — head to the paint-peeled Peña la Perla for some authentic cante jondo singing. For the best pescaíto frito (mixed fried fish) and shrimp tortilla, head to El Faro (00 34 902 211 068, elfarodecadiz.com). For £21 the menú del dia is amazing value. Return flights to Jerez, with Ryanair April–September. During the winter months, fly to Seville.